Planning a trip to a zoo? 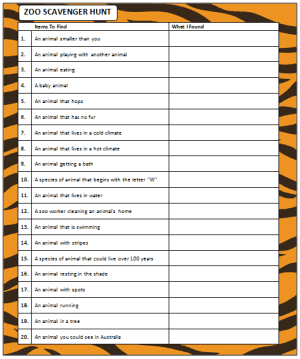 Bring along this free printable Zoo Scavenger Hunt and see how many items you & your children can find. It’s a great way to learn a bit more about the zoo and the animals that live there. To play the game, you’ll need the free printable game (available through the link above) and a pen. It’s also a fun idea to bring your camera to take pictures of all the interesting animals at the zoo. For added difficulty, you can make a rule that each animal can only be written in the “found” column once. Looking for more fun ideas at the zoo? Then check out these ideas before your next zoo visit. If you like this free printable game, we have plenty more to share with you! Simply visit our Free Printables page for a listing of all our freebies. You can also follow us on Facebook to stay updated on the latest ideas for family fun.